This oak kitchen was in Hertfordshire near Berkhamstead in a beautiful old farmhouse. It had been fitted over 20 years ago and was installed by Smallbone. The clients loved the the very well made solid oak cabinets and the layout of the kitchen, But decided it needed up dating by having it refurbished and hand Painted and also changing the handles. I explained to the client the process we would go through , After deep cleaning with a degreaser and a complete sand down , We would prime with Tikkurila adhesion paint, This would also act as a stain block to hold back any tanning bleeding through the paint film from the oak. I then applied a 2nd undercoat and completed with Benjamin Moore Advance satin waterborne top coats.The clients where delighted with what is possible with a very well made kitchen. Notice how the new brushed steel handles transformed the look of the kitchen and looked a lot more up to date. The new paint system would have been touch dry the same day and been usable within a couple of days. It would of fully cured after around d 28 days , At this point the surface paint would be at its peak durability, And would be good for years to come. 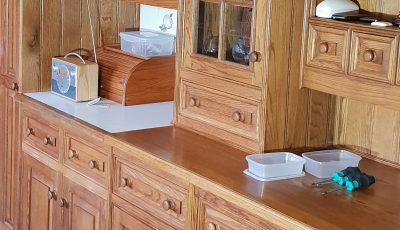 On this refurbishment we also sanded back the oak worktops and applied 2 coats of Osmo worktop oil a very attractive and durable finish which is also 100% food safe. As you can see from the review the clients submitted on our website they where delighted with the completed kitchen. If you would like a free non obligation quote for your kitchen your only an email away, Just send me photographs of your kitchen furniture showing all areas to be painted and any ideas on colours and finishes and I will send a full specification and quote back in 48 Hrs.